Schumann completed his Symphony No 2 in 1846 when he was recovering from illness (that eventually brought him to his grave). "It was the resistance of the spirit that was here at work and helped me to combat my condition. The first movement is full of this struggle and its character is capricious and refractory", the composer wrote. The general concept of the symphony is heroic and epic and reminds of Beethoven's symphonies. However Scherzo is probably closer by its colour to the music by his contemporary and a good friend, Felix Mendelssohn. We dare say however that three of four movements of the symphony constitute good German music whereas the third, slow movement presents a masterpiece of Schumann's lyrical compositions. That was his inspired message to Mankind the Musical. It revives the Bach's spirit: some musicologists see the genesis of the Adagio theme in Sonata (trio) of Bach's Das musikalische Opfer. But then there is something more important than simple similarity. The Bach's mourning transforms itself into a quiet reverent Schumann's sorrow. In contrast to the symphony in which, according to Daniel Zhitomirsky, Schumann "was not always able to do what he wanted" his Overture to Byron's Manfred appears to be one of the main achievements not only of his own creative work but also of the romantic music in general. Developing the traditions of the program music in Beethoven's overtures (Egmont, Coriolan) Schumann, on the basis of a subtle leitmotif work, produces a poetic form that is characterized by indivisible flow of sensation and thought. The contrast of the dramatic (Manfred) and lyrical (Astarta) elements comes out from a single root. 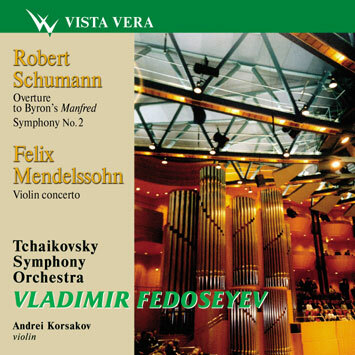 Felix Mendelssohn's Concerto for violin and orchestra is probably a central composition in that genre in all history of music. A brilliant violinist himself Mendelssohn had his doubts at first as to a virtuosity of the concerto. He consulted his friend, Ferdinand David, who was a celebrated virtuoso violinist. In the end the result surpassed expectation. The Concerto is notable for its clear form, a marvelous balance of solo and orchestral parts, and inexhaustible melodious generosity (Medelssohn composed a beautiful elegiac theme even for a passage from a slow second movement to the finale). All these merits raised the composition up to the top of the musical Olympus where it stays to nowadays.